The Avocent LongView LVIPVG-001 is an IP VG Digital Extender with PS/2 and USB keyboard and mouse connectors, VGA video, and audio. This extender will enable you to separate and locate users and their computers anywhere on an existing LAN. This improves data security, removes computers from harsh environments and addresses limited workspace environments. Question: What items are included with my Avocent LVIPVG-001? Power supply and cord included? What firmware version is installed? What are the spacing dimensions of the mounting screws for the reciever and the MMK-01 mounting plate? Answer: Thank you for your inquiry. The Longview IP KVM extender will come with a receiver unit, transmitter unit, an external power supply for the receiver, IEC power cord, and a quick installation guide. In terms of cables, the transmitter unit will plug directly into the server/computer and the receiver will use the cables supplied with the keyboard, mouse and monitor. A UTP cable (not supplied) is required to connect the transmitter and receiver. The transmitter will get power from the attached computer. If there are not 2 open USB ports on the remote computer, an additional power supply will be needed for the transmitter. 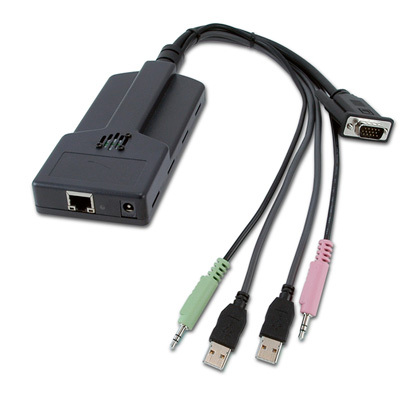 To access the Serial menu a null modem serial cable (male DB-9) or three-wire serial cable is required (also not supplied). The serial menu allows you to: Configure network settings for the receiver and transmitter, set or change passwords, upgrade your firmware for the receiver and transmitter, reset to factory defaults, set a session time-out value and change the audio performance settings. The firmeware version should be the latest for this unit: 4.0.0.9 released 01/17/2011. We are still waiting to hear back on the specifications for the MMK-01 mounting plate and will update this post when we have more information.